Themaximum effectiveness and anti-UVB the incomparable performance anti-UVA of MAX Ultra Photoderm Fluid with color protects safely against sunburn, Sun intolerance reactions prevents and combats premature skin aging. The ultra lightweight texture of Photoderm MAX Ultra Fluid with color leaves a sensation of extreme softness on the skin. Photoderm MAX Fluid with color spreads easily, leaving no oily feeling or white markings. 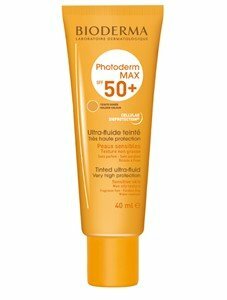 Photoderm Max spf50 +, Ultra-Fluid with color: Fluid texture, with color that when applied, leaves the skin without an oily feeling or with white markings. With color, can be used as makeup base.